Long time user first time poster here. I find myself using the "Compare" context menu option several times a day. I've been looking for a reliable way to add a system-wide keyboard shortcut to trigger that option whe I have any 2 files/folders selected but have found almost none apart from a sketchy trigger via AutoHotkey. Do you guys know how can I achieve this? I'm on Windows 10 x64 using BC4. In the Tools menu -> Options dialog, Toolbars/etc tab, Select View: Folder Compare, you can search for and assign hotkeys to commands, such as "Compare Contents" or "Compare To" (default: F7). You can then use these commands from the Folder Compare with the context menu or the hotkey. Which "Compare" command were you specifically searching for? Or were you referring to the Windows Explorer context menu? If you hit the Context button on your keyboard, the pop-up will show the letter hotkey assigned to every shell extension. 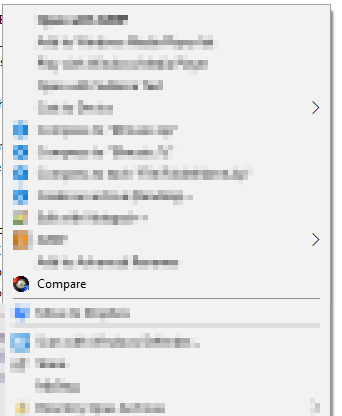 The hotkey for the Compare context menu in Windows Explorer is C.
All times are GMT-6. This page was generated at 03:30 PM.